As mentioned last week, I am super excited to be posting something every Monday. This week's art journal image was the result of my needing to "take a deep breath" while at work. I spent some time at lunch creating a quick image (only took me about 10 minutes). It allowed me to escape the reality of my day and did wonders for my afternoon. 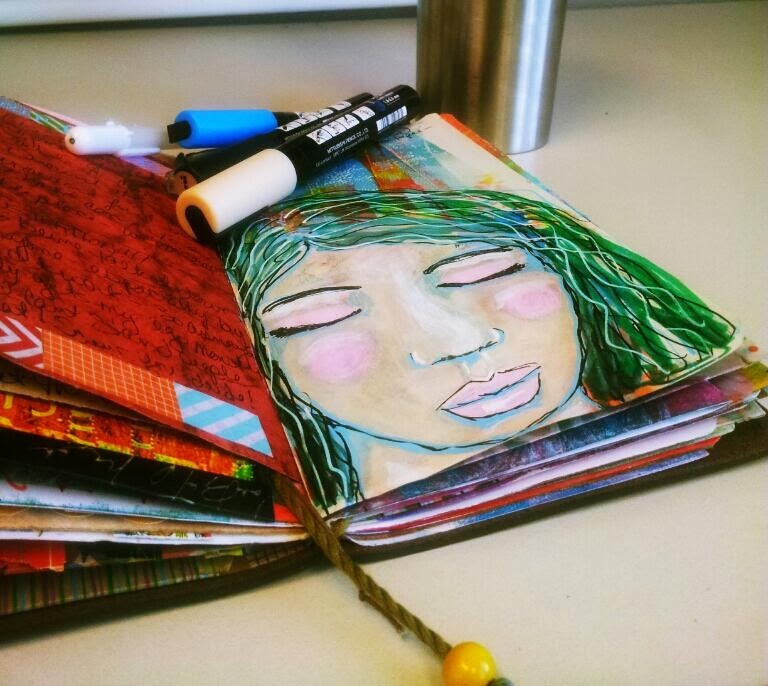 Are you art journaling during the day? What is in your on-the-go bag? This image was created in my Midori Traveler's Notebook with Uni Posca paint pens over a gel print made on Midori paper with my Gelli Arts Gel Printing Plate. I had an exciting opportunity recently to interview the one and only Effy Wild. I have been chomping at the bit to share it with you all, but wanted to wait until the new year. Let's get wild in 2014! Q: Effy, when I was new to art/art journaling, I found myself seeking out other artists/art journalers, watching videos, reading blogs, etc. Luckily I stumbled across this very live-out-loud woman doing this very interesting thing called “Book of Days.” Your work with BOD challenged and inspired me to define my own art journaling practice. Such a gift! Thank you! Who inspired you initially and how has your art journaling practice evolved over time? A: I was initially inspired by Connie Hozvicka's class "Art Journal Love Letters" (now retired) and swiftly moved into classes with Tamara LaPorte. This came during a time when I was a blocked writer looking for ways to be creative that might bypass the block. 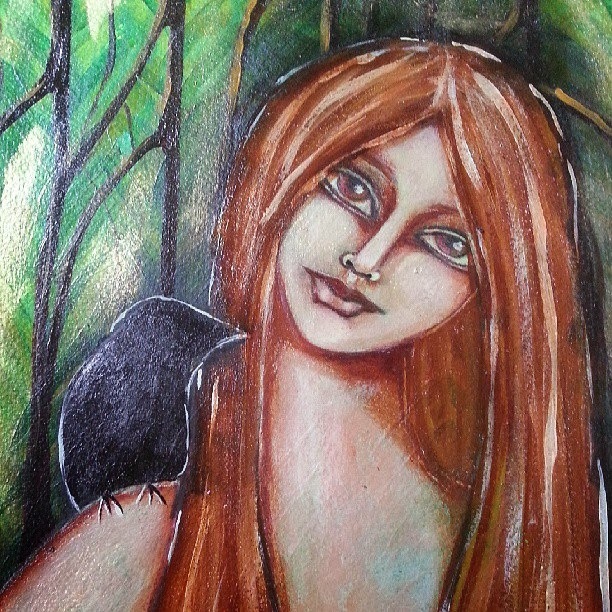 My art journaling practice was very much informed by my years as a writer, and I took everything I'd learned in Julia Cameron's "The Artist's Way" to heart as I created a regular habit of expressing myself through mixed media art journaling. Book Of Days was inspired in part by Julia Cameron, but also by Julie Fei Fan Balzer's "30 Days In Your Art Journal" and Donna Downey's "Inspiration Wednesdays". I wanted to combine the practice of adding bits and bobs to my journal every day (as a kind of "morning pages" practice without the long hand) and creating a fully formed mixed media spread in my journal (a la Inspiration Wednesdays). As you can see, I'm standing on the shoulders of a LOT of creative goddesses! Q: You have quite a body of work, more than most I would say. Your consistency with your practice is amazing. How do you do it? A: Art journaling is my primary spiritual practice. I make it a *habit* to sit down in my studio (or on the couch) as regularly as time permits. I don't wait for inspiration to strike. I don't wait to 'feel like it'. I know that as soon as I start splashing paint around, something will happen. I also take a LOT of classes. These classes act as catalysts for me. I may only *actually* do one or two lessons in each class I take, but I always save the ones I can download for future viewing and when I've got a block of time, I'll indulge in some play time. These classes inform my practice by adding new skills and techniques. A: My art journals live on a shelf above my studio table as a reminder that I have built quite a body of work. Occasionally, I will flip through them (with much trepidation - there's a lot of sticking going on in some of the older journals! ), but mostly, I gaze lovingly at the profiles of these fat, happy journals and swoon with pride over how much work I've done since I started at the end of 2009. Effy has a distinct style. I would know her work any where. Q: You have developed such a distinct style. I know in an instant that something is uniquely yours. How do you define your style? What advice would you give others in trying to develop their own style? A: Wow! Well, I don't actually see my style as unique and distinct yet. I feel like I'm still finding my voice, and I see a lot of my earlier and more current influences in my work. I define my style as "Intuitive". I would advise others to create a regular practice, don't be afraid to emulate the artists you love in your work, and *keep experimenting*. Your own voice will shine through. Q: What are your can't live without art/journal supplies? Q: What have you mastered and what are you still trying to achieve as an artist/art journaler? A: I feel like I've mastered interesting layers and front facing portraits. I have also mastered journaling with soul. While I see the value in making pretty pages (who doesn't love a pretty page? ), I find it much more fulfilling to fill my journals with my soul stuff. It's very important to me that every spread I create has some element of ME in it, be that via the words I include or a symbol or the emotional tone in my faces. I'm still trying to master figure drawing, 3/4 and profile portraits, painting loosely, and including poetry, which is my first love. Q: How can people get in touch with you? What are you up to in 2014? Join me next week for part 2.